Sixty prisoners have taken control of part of a wing at a prison in Kent. The Prison Officers Association (POA) said there was an "ongoing disturbance" at the category B training prison, HMP Swaleside, on the Isle of Sheppey. Specialist "Tornado" teams have been deployed to tackle the unrest, the Prison Service said. POA chairman Mike Rolfe said the extent of the disturbance was unclear, but it did not appear to be on the scale of a riot at HMP Birmingham last week. Riot police were used to quell last Friday's disturbance, which lasted for 12 hours and involved hundreds of inmates. A Prison Service spokesman said: "The Prison Service is dealing with an incident involving 60 prisoners at HMP Swaleside. "The incident is contained to one landing on A Wing. The rest of the prison is secure with all prisoners in locked in cells." Later, he added: "The situation at the prison remains contained and is in the process of being resolved." Mr Rolfe described Swaleside as "a particularly difficult place to work" because of an "acute staff shortfall" and high levels of violence. A man claiming to be an inmate there contacted the BBC to say the disturbance had started when staff raided cells and confiscated prisoners' possessions. The unverified source said tension between inmates and prison officers had increased after an intake of young, inexperienced staff, and the cutting of family visits. 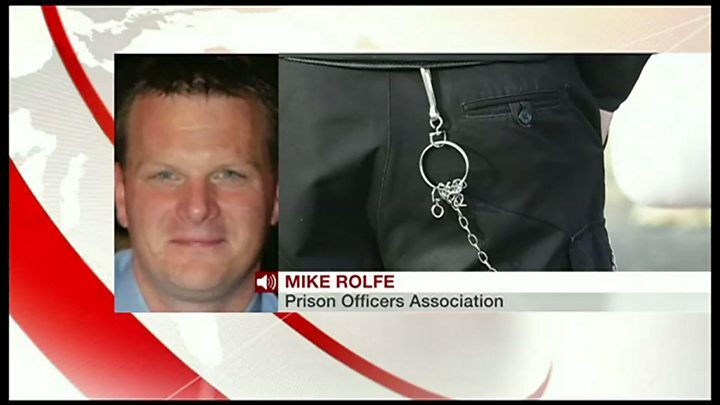 Media captionMick Rolfe, chairman of the Prison Officers Association, said Swaleside Prison was a "difficult place to work"
BBC home affairs correspondent Danny Shaw said the disturbance had been contained but prisoners had refused to go back into their cells. "Tornado" squads were also used to quell last week's riot in Birmingham, after prisoners set fires, stole keys to residential areas from a guard and one inmate was seriously injured. Up to 240 prisoners were moved following the riot, but the Ministry of Justice has not commented on whether any were sent to Swaleside. Guardian prison correspondent Eric Allison said he had been told of problems at the prison during a recent research visit. "The governor told me that it was a troubled jail," he said. "He said that there were high levels of violence and access to and use of [formerly] legal highs". However, Mr Allison said Swaleside, which houses about 1,100 inmates serving terms of more than four years, had some "innovative" education schemes. An HM Inspectorate of Prisons report in July described the prison as "dangerous" and found levels of violence were "far too high", with many of the incidents classed as serious. In a letter to the Times, Nick Clegg, Ken Clarke and Jacqui Smith said jails had become unacceptably dangerous. They said inmate numbers had risen to more than 85,000 since Michael Howard declared in 1993 that "prison works". Former Lib Dem leader and deputy PM Mr Clegg, ex-Conservative Home Secretary Mr Clarke and former Labour Home Secretary Mrs Smith said the recent violent unrest at Birmingham Prison was a "wake-up call for this country". 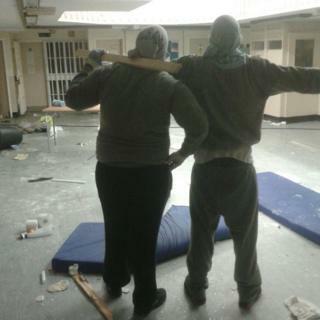 HMP Birmingham - 16 December - Specialist riot squads were deployed after a riot broke out involving hundreds of inmates and lasted more than 12 hours. HMP Lewes - 29 October - A national response unit had to be brought in to control the prisoners at the East Sussex jail during a disturbance which lasted for six hours.